NOW anyone can order Mel’s Mix over the Internet and have it shipped right to their door! The Home Depot sale price is very reasonable: $8.95 for a 1.5 cu ft. bag. The shipping is very expensive for the first 6 bags, which amounts to $55 (whoa that’s much too much. But wait, there’s more as they say on TV). Every bag thereafter is free shipping in the same order and to the same address. *** News Flash! We find that Home Depot keeps changing the offer. One day it’s $55 maximum shipping, the next day it changes to $150, and then the next day they say it’s no longer available on the internet. So my advice it treat it just like the weather…if you don’t like the weather today, wait until tomorrow and be quick to order it when it’s the $55 shipping price. You can check this on the website at http://www.homedepot.com/p/t/203272590?catalogId=10053&langId=-1&keyword=11760&storeId=10051&N=5yc1v&R=203272590#more_info or call number # 1-800-430-3376 and give them the model # 11760. That’s unheard of in most other product orders. So if you are building a small to medium size SFG, you are going to need 30 – 40 bags, that makes it under a $1.50 a bag for shipping. If you are building a big SFG, you are going to need 50-70 bags – now the shipping is under $1.00 per bag. The best part is it doesn’t matter where you live – the shipping is exactly the same. So in summary, for under 10 bags it’s just too expensive to ship. But once you get over 20-30 bags, it’s really very inexpensive and it comes right to your door within a few days. So I think that’s a pretty good deal Home Depot is giving us. Here’s another idea, as long as you are going to order some, why don’t you ask your neighbors, family, and friends – even those at school, church, or at work…if they’d like to come in on the order. Then we are talking about almost 25 cents for each bag for shipping. That’s cheaper than driving to the store even if they had it. Now remember, the good news is after 6 bags all the rest are FREE! So 10 bags is still $55 shipping and 50 bags is still $55 shipping and 100 bags is still $55 shipping! No matter how many bags you order, shipping is $55 maximum as long as they are delivered to the same address. So if you needed 100 bags that’s only 55 cents per bag for delivery. If you and a neighbor want to start a small family SFG of say three 4’X12’ boxes for each family, that would take 64 bags /house so 64 x2 into the $55 shipping = 43 cents shipping /bag. The added advantage is you do all this from your armchair with no trip to the store. You know what that is like, right? So as of this date, you can order Mel’s Mix from Home Depot and have it shipped right to your door anywhere in the continental USA. Yes, at first the shipping seems expensive; however, if you consider a typical trip to the store, it might go something like this: Get everyone organized to go, then fight traffic, try and find a close parking spot by driving around the parking lot, aisle by aisle, finally park, go inside to search, find the display, talk it all over again, look for the kids, then go get a cart, load up, stand in line to pay, search the parking lot for where you left the car, find a dent in your car door, load into car, tear and spill one bag all over your nice new van, have to fill up on gas, end an argument of I told you so, decide to stop for lunch, go home, unload, collapse, etc. etc. 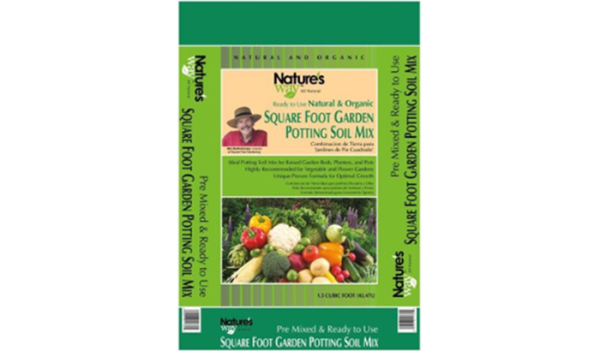 First, it is called Square Foot Gardening Potting Soil Mix. 1. INTERNET. Copy & go to: http://www.homedepot.com/p/t/203272590?catalogId=10053&langId=-1&keyword=11760&storeId=10051&N=5yc1v&R=203272590#more_info to place your order for delivery right to your door. 2. OR you can call this TELEPHONE # 1-800-430-3376. Give them the model # 11760 to have it DELIVERED RIGHT TO YOUR DOOR. Tell them how many bags you want, remember after 6 bags the shipping doesn’t increase. The more you order this first time, the cheaper the shipping per bag. You can order any number over 6 and the shipping will still be only $55. Total. A good time to ask all your friends if they want to go in on this order to save money. Please note, there’s a Plan A and a Plan B. Plan A is to have it shipped right to your door; Plan B is to have it shipped to your local Home Depot. UNFORTUNATELY, plan B is not in operation even though there’s that option on the website. You cannot at this time order on the internet to have it shipped to your local HD store. BUT call your local HD first to see if they might already have it in stock, then just go and pick it up. Here is a great opportunity to show HD that people want Mel’s Mix and will even pay shipping to get it and why don’t they stock Mel’s Mix in all their stores? If all the above fails, pick up the phone and call this Home Depot 800 number and they’ll take care of you with a real live person on the other end: 1-800-430-3376. Give them the model # 11760. P.S. HERE IS THE BEST PART OF THE WHOLE DEAL! It is Gro-Well’s Product Guarantee: “If you are not completely satisfied with this quality product, Gro-Well will gladly refund the purchase price.” How could it get any better?? Get busy and place your order! Wow, I just paid $25 for a 2 cu ft bag of sq ft gardening soil from Ladybug at a local nursery – actually $100 for soil for 1 4×4 SFG & I have seedlings ready for 2 boxes. I tried the HDs within 25 mi. and even provided the model #11760. As you said above – I was told they would not deliver to the store in this region. Using the cost with shipping from HD on line, I still would have saved about $75 getting 21cu ft mailed w/o sales tax. Oh, well, I’ll still enjoy my 1st yr of SFG. In the past, Home Depot has changed the shipping from $55 maximum, then to $150 maximum, then to no longer available. They seemed to have settled now on $150 maximum and they have been a little upset at the number of calls. So please do not call them to try and get them to change the shipping. Whatever they post on the website is what it’s going to be for that day. All I can advise is as mentioned on my blog, treat it just like the weather…wait until tomorrow and it might be a sunny day and then you can go to the beach. After several days, if it doesn’t change back to $55, then I have to assume they are going to keep it at $150. We have no control over what they are doing and I’m sorry it has changed and been a concern to everyone, but we have to live with whatever they post that day as the shipping cost. We have to be thankful that they are even carrying and selling Mel’s Mix on their internet catalog. So Thank You Home Depot for that. You can still call them on the 800 number to place your order, but you cannot call them to ask to have your order shipped to your local store, even though it looks like that is an option on their website. So hopefully we can get over all these hurdles and get the Mel’s Mix out where the people need and want it. Thank you for your patience and understanding, as well as your continued support of the Square Foot Gardening movement. After trying for days and days to get the $55 shipping on Mel’s Mix from Home Depot online, I finally called the 800 number – and it couldn’t have been any easier. I ordered 30 bags and got the $55 shipping right to my door!!! No problems. He looked up the inventory and asked how many bags! THANK-YOU, Mel!!!!! Called Home Depot. They insisted the shipping was $150.00. Is there no other way to get this? In the past, Home Depot has changed the shipping from $55 maximum, then to $150 maximum, then to no longer available. They seemed to have settled now on $150 maximum and they have been a little upset at the number of calls. So please do not call them to try and get them to change the shipping. Whatever they post on the website is what it’s going to be for that day. All I can advise is as mentioned on my blog, treat it just like the weather…wait until tomorrow and it might be a sunny day and then you can go to the beach. After several days, it if doesn’t change back to $55, then I have to assume they are going to keep it at $150. We have no control over what they are doing and I’m sorry it has changed and been a concern to everyone, but we have to live with whatever they post that day as the shipping cost. We have to be thankful that they are even carrying and selling Mel’s Mix on their internet catalog. So Thank You Home Depot for that. You can still call them on the 800 number to place your order, but you cannot call them ask to have your order shipped to your local store, even though it looks like that is an option on their website. So hopefully we can get over all these hurdles and get the Mel’s Mix out where the people need and want it. Thank you for your patience and understanding, as well as your continued support of the Square Foot Gardening movement. Looks like I will be making my own. Well I’m sorry about that, but I understand when the cost of shipping a product approaches as much as the bag costs in the first place, that’s just too much. We tried our best to have Home Depot return their shipping cost back to the original $10 a bag to start with, going up to a maximum of only $55 no matter how many you order. Some suggestions on mixing your own. Depending on how much, review the book’s advice on how to mix. Follow all of the safeguards, how to measure, and what to buy. But do mix it by placing all 3 ingredients on a large tarp or sheet of plastic. Then with just 2 people you can roll the plastic from one side to the other…and then back again. That keeps it from crushing all the ingredients, especially the vermiculite. And it’s not really very hard work. Make sure you keep it dry at first and don’t use any tools, like rakes or shovels, to mix. Just let gravity help you do the mixing of the 3 ingredients as you pull the tarp from one side to the other. You know that it’s mixed enough by the blended color of the finished product. Then you drag the tarp to your box and as you fill the box, either with a pail or scoop (a dustpan works great) and that’s the time to start watering (with a fine spray)…as you add it to the box. NO! Don’t put Mel’s Mix over the bare ground…all your native weeds will come up right through your garden. First lay down a good, strong weed fabric available at any garden center. Then your Mel’x Mix will go right on top of that. Add your grid and you’re ready to start planting. Good luck with your newly enhanced garden. Let us know who it compares to your old garden. When I ordered it from Home Depot last week, I ended up having a live chat and asked about the shipping. I was ordering 10 bags and the shipping cost more than the bags. The chat person explained that they were charging $10 a bag for shipping. She agreed with me that the shipping shouldn’t cost more than the product and as a 1 time thing, offered to make the shipping $10 total! Not sure if they all do it, or if it was because my order was relatively small, but they were very helpful. You really got a deal! I’m very pleased that the Home Depot representative gave you a special deal. We’ve been hoping that they would return to the maximum shipping fee of $55, but it seems stuck on $150…not matter how many bags you order. Of course that starts out at $10 a bag until you get more than 15 bags and then it stays at $150 maximum. Your experience just proves talking to a live operator is much better than communicating with a computer. Thanks for letting us know your experience and good luck with your garden. Concerning the decision to make the bags 1.5 cubic feet, that was decided by the manufacturer and I am not sure of all the thinking that went in it. Here’s the history…we started out with 2 cu ft bags, which make the math very easy. However, they found out they were very heavy and women especially did not like picking up such a heavy bag…loading and unloading. So I decided 1 cubic foot bags would be ideal…however they would cost more because you would have 2 bags, 2 fillings, 2 carries…for every 2 cu ft. So I lost on the decision and they said they would compromise and would make it half way between 1 and 2. Now that works prefect for a children’s garden that requires 4.5 cu ft… which is 3 bags exactly. But for the adult 4×4 box, which needs 8 cu ft, you have to buy 6 bags and leaves you with an extra cu foot for other boxes or flowerpots. The only size that would suit any and all size boxes would be the 1 cubic foot, but then the price would be more and people would complain and maybe buy someone else’s mix that is cheaper and in bigger bags. So I appreciate your thought that everything about SFG is efficient and is as economically as we can make it, but sometimes one size does not fit all. You have to remember that the way I designated the basic adult size of 4×4 is that I actually measured different people’s comfortable reach and found that 24 inches was possible by everyone. Walking all around a box, reaching in from all 4 sides gave us a 4×4. Also lumber comes in 8 ft lengths. Children have shorter reach and it turned out that a 3×3 was a perfect size. So that’s the story Beth, I don’t want you to think that I’m slacking off on my engineering calculations. We continue to make SFG the simplest, easiest and most practical method known to mankind. As an added thought, any potting soil is expensive. But people fail to realize that it will last approximately 10 years and all you add each year is that trowel full of homemade compost as you replant each square foot with a new, but different, type of plant. So let’s take your order as an example. 26 bags with shipping cost you $244. I agree that seems like a lot at first. But that will be only $24 a year for your approximately 5 boxes. So when you look at each box, just think all that wonderful Mel’s Mix for that one box cost you less than $5 a box per year. And the best part is you are going to harvest at least 100 to 200 dollars of fresh salads and supper vegetables every year from that one box. Not a bad 5 dollar investment. How does that sound? As for the storage, they sit in the nursery for months until sold. I just wouldn’t let them get real wet and I would use the bags within a month or else store them in the garage. Mel, Here is an update! I just placed my order for 26 bags of mix for $10 shipping!!!! I went on live chat and told the operator of my dilemma. She said the shipping would be $860!!!!!! After some waiting she came back and said they would charge me the price to ship one bag! I couldn’t place the order fast enough!!!! She waited as I placed the order. I then gave her the order number, in a few minutes she said it would take about an hour to reflect the adjustment. Can’t wait to start my garden!!!! I’m so happy for your experience and I think we could recommend to everyone what you did….and that is talk to an operator either by 800 number (1-800-HOME-DEPOT/1-800-466-3337) or live chat, and tell them you want to buy the Square Foot Gardening Potting Soil Mix product (Model # NW 11760) and what is the best shipping charge they can give you. As a foundation we are not allowed to interfere, comment, or get involved in any way…so please do not mention my name or the SFG Foundation. Just tell how many bags you want to order and what can they do for the shipping for you. You certainly got the best deal I could imagine, $10 shipping for all those bags. That’s wonderful. Congratulation! You must be a good negotiator. The next time I need to make a deal, I’m going to call you and have you act in my absence. I hope everything goes well with the shipment and the start of your garden. Please keep in touch. You might be want to document the start of your new garden with photos and a log so you can enter our photo contest this coming summer. I tried to order it on HD’s website and they’re charging $400 shipping for 40 bags. I’m going to pass on to you someone else’s letter that explains the whole unfortunate situation. But there is a light shining in the distance. It’s a real live telephone operator somewhere at Home Depot that can understand the problem of high cost shipping and sometimes they have made a special deal over the phone with the customer. We here at SFG have no control over that and in fact have been told to stop trying to get a different arrangement for shipping or else they would take the product right of the catalog. So if you will call this 800 number (1-800-430-3376 ), tell them you want this product model number #11760 and how many bag you want. Ask them what is the best deal they could give you on shipping and it might be their your day. But please don’t tell them I sent you or that you have anything to do with the SFG Foundation. Good luck and let us know how you make out. I had 10 bags of Square Foot Garden Potting Soil Mix delivered and Home Depot only charged me $10 shipping! I called them and they wouldn’t budge. Then I went online and chatted with someone on their site and it she said she would ship them for $10. I couldn’t believe it! I had them all delivered in a week and I’m very pleased. My experience is the same as Valerie’s, online and over the phone. I agree…don’t order under those conditions. However we do keep getting letters from some people where either they were very persistent or just happened to get a good Home Depot representative, who after listening to the high shipping rates, agreed to lower them considerably. At least in half…some even lower. So, keep trying, don’t get discouraged, and I’ll bet you too can somehow make a deal and get your bags shipped right to your front door. We ordered 16 bags of Mel’s Mix and used it in 2 – 4’x4′ raised bed gardens. Our tomato plants are flourishing and growing extremely well. They are 3 times as big as my mother’s tomatoes in her garden. However, the squash and bell pepper plants have turned yellow and are not growing at all. I planted some squash in a container in our “old” garden soil and they are green and have already passed the other squash in the Mel’s mix. What is wrong? Was the Mel’s mix too hot? Has anyone else had this problem. What can we do? It seems as if you are having some problems with plants in different locations. It is always difficult James to say, with a little bit of information, what possibly could be wrong. I’m going to send this letter to our soil company; they’ve had so much experience over the years with the soil mix and quite often will have an idea when you say this plant is doing well, but that one’s not doing so well. So you should hear back from them pretty quick and they’ll ask you for a layout of your garden beds, where the Mel’s Mix is, where the old soil is, and where you’ve planted different things. Maybe a couple pictures too. So be on the lookout for a letter from the Grow- Well Company. Thanks for writing and let’s hope we can get everything growing real well for you! It is discouraging that everyone is having such a hard time getting Mel’s Mix, but I am wondering why they don’t just make their own? Last year I was really confused about the calculations, but today, I had a sparkling revelation. It suddenly occurred to me that all I have to do is measure equal amounts of each ingredient: vermiculite, peat, and compost. First of all, it is not necessary that you come up with a total of exactly 8 cubic feet, if you intend to continue to SFG, because you can simply bag the extra mix for the next box you create. However, if you are particular about mixing only what you need, I believe that a 14 gallon Rubbermaid tote (or equally sized cardboard box) full of each of the three ingredients would be equal to 7.95 CF. That’s pretty darn close to 8! (Feel free to check my math and let me know if I am correct.) So, I measured using a Rubbermaid tote. I filled it with peat, dumped it on the tarp, then repeated with vermiculite, and then my already mixed compost. Once blended, I had my mix! I have been successful at getting different types of compost at different garden centers, such as worm castings (which they graciously ordered from their wholesaler for me), fully composted poultry litter, fully composted cow manure. I simply read the labels to make sure the ingredients are 100% compost. I hope to start composting, but have not yet made the leap to that. Happy gardening! You really did have a sparkling revelation. I’m proud of you Colleen! Thank you for sending that in, you are absolutely right. If you buy enough of the three ingredients why try to figure it out by volume stated on each bag. Just buy enough of each and store them in the big barrels or boxes and then just dip out = number of pails of each of the 3 ingredients. You will have some leftover but just save those for the next batch (if still in the unopened bag, you can always take it back for a refund if you want.) The peat moss comes compressed, so you open the bale up and loosen it, but you’re not exactly sure how much you’re going to have. It is usually twice the compressed size. Your idea would work equally well with peat moss as with the other two ingredients, because everything comes in a different size bag. Not three months after the first edition book was published and on the market, compost manufacturers decided not to sell it in cubic feet, but to sell it in pounds, and of course that threw everyone off from that stand point. Your idea would have work then. However, now they are back to selling in volume. Colleen, let’s use your method for everyone, but first they have to buy it and then they’ll have to know approximately what the volume is. I do agree with you to have some left over and actually not every SFG box is going to be the same size. Meaning you may not need exactly 8 cubic feet. Some boxes measure 48” on the inside, some on the outside and other models somewhere in between. Why not have extra so you can do little pots, or fill in when you have heavy rains that can compact the peat moss down a little bit. I’m going to revise my advice to everyone and use your idea. So first you’ve got to buy enough to have equal parts, in volume, of the three ingredients. Of course when you have to buy separate compost in order to get a blended one, you may need to do a little bit of figuring. Most everything today comes in 1 or 1 ½ cubic feet until, again, they suddenly switch to quarts this year. How many quarts are in a cubic foot? Oh my goodness! Invent a new way to garden, make it simple and easy and then someone makes it difficult again with all these complications. Colleen, you asked why everyone doesn’t just mix their own. Well that’s part of the problem, what to buy, when to buy and how much to buy. As you said you had to go to several different garden centers to get a variety of compost so you could have a blended product. I’d like to use this letter to give some other advice about mixing. If you have a tarp, what some people do is dump all the ingredients into the middle then think, well I’ll have to use a rake or shovel to mix it around, which could crush some of the vermiculite. Here’s what we do, get a large enough tarp about a 16’x16′ square lay it out on the ground, then empty your bags or buckets of each ingredient, not in the center, but along one edge of the tarp making sure it doesn’t spill over the side. Then with the next ingredient we do the same thing, by emptying it out along that first line, and the same with the 3rd. right on top of the other ingredients. Now, when you have two people to roll the tarp, most of your mixing has been done already. It mixes much quicker and much better, so in essence instead of making one big pile and trying to move it around the tarp by pulling on it you are laying the ingredients out in a line and pulling 2 corners of the tarp to the other empty corners, and back again. Hope that’s clear enough. In your search for different compost I notice you said you read the labels and that is very important, it just adds to everything and to the amount of time it takes to get all the proper ingredients. That’s why we caution sometimes when you go into a nursery, especially a small one, they will say “Oh, we’ve got compost already made all mixed and it’s really good!” then we find out that it is not much of a blend, and we don’t recommend you buy it. For all those reasons people say, “I wish they had Mel’s Mix all mixed and put in a bag.” Well we do, and we’ve had it for two years. We have a good manufacturer, but they sure are having a hard time getting distribution. You can imagine how hard it is to get your product into Home Depot, Lowes, or any of the other big box stores. The really big commercial companies that also make potting soil have pretty much taken over, and they make it very hard for a newcomer to come in, no matter how good the mix is. I guess they’re a little afraid of competition, but someday soon it will be everywhere. Well thanks again Colleen for your very nice letter and your figuring out how to eliminate a lot of the calculations. You are absolutely right; you do not have to end up with exactly 8 cubic feet, hopefully you’ll have some extra that will come in very handy in your garden. Yikes…shipping was $500. Guess ill be making my own. That’s just way too much, so I don’t blame you. As I’ve mentioned so many times, our hands are tied…even to the point where they say if Mel calls Home Depot once more and complains, they will take the product right out of the catalog. So Nicole, I’m behind you, but you have to do it on your own. Other people are some how getting through and getting a reduced, reasonable shipping. Read some of the other letters and then just cal; again until you find an agreeable Home Depot Representative that can give you a better deal on shipping. Good luck and let us know who you make out. Could you tell me please if it’s possible to get Mels Mix in the UK, and if so, where from? Hi Poppy Thanks for asking, do you know my Grandfathers( I have 7 grandchildren) name to all the kids is Poppy. I’m sorry that at this time we have no distribution in the UK yet. However we are trying to interest our US supplier to go World Wide and if they aren’t interested, we will find a soil maker/company in the business in the UK to package M.M. YOU could help us greatly, at your local nursery or big box store, could you write down the names of the potting soil and garden soil mixes they sell and which company makes each one and send those to me. We will then contact them to see if we could interest then in a license to package and distribute Mel’s Mix in the UK. In the meantime, all the ingredients should be available to you locally if you want to mix your own, although you might want to substitute Coir for the Peat Moss 1/3 portion; we know how sensitive the Brits are about using Peat Moss anymore. I’ll also keep your address on file to let you know what progress we make, you may be interested then in knowing YOU started it. Thanks again, How did you hear or know about Mel’s Mix? from the new Sq Metre book or on the internet? Thanks for your response. I’ve not had a chance to make a note of the various composts out there yet. But I shall. In the mean time I am a little confused. Isn’t Peat Moss Compost? I haven’t been able to find any anyway. What does one use instead? Sorry I don’t think I made myself very clear with my last post. If substituting Peat Moss with Peat free Compost, isn’t the mix 2/3 compost to 1/3 vermiculite? I built a raised garden bed 4′ x 7′ x 16″ – before ever hearing about SFG. I then went online to figure out what kind of soil to fill it with stumbled across SFG. I’ve ordered the book and am looking forward to making my raised garden into 28 little SFG’s. Like everyone else, though, I’ve been convinced that Mel’s mix is the best way to go, and yet its out of reach- almost. First a question: my 16″ deep raised garden is deeper than what I see others doing. So its going to cost me almost triple what it needs to. But in term of aesthetics, it fits our yard. I’ve got the book on order, arriving Tuesday. Besides the initial cost, will there be any problem with a 16″ deep garden? Will it actually be better? Would you fill it with anything else before topping it off with Mel’s mix? I did actually find Mel’s Mix but its a little confusing. Its a different brand, but our Lowe’s carries it as the Garden Time brand. It looks like Garden Time is a Gro-Well brand – from what I can tell it is the same thing as what is pictured here. The one difference is the bag is slightly smaller 1.3 cu ft. for 8.97. So it looks like I’ll need to buy about 29 bags for $260. Ouch! I’m tempted to pull the trigger and do it. Is this in fact authentic Mel’s MIx? Should I fill the lower part with something cheaper? First a question: my 16″ deep raised garden is deeper than what I see others doing. So its going to cost me almost triple what it needs to be .NO YOUR BOX MAY COST YOU TRIPLE SINCE YOU WANT IT THAT DEEP TO FIT IN WITH YOUR YARD BUT NOT THE MELS’ MIX in term of aesthetics, it fits our yard. I’ve got the book on order, arriving Tuesday. Besides the initial cost, will there be any problem with a 16″ deep garden? YES- COST’S TOO MUCH WHEN YOU NEED ONLY 6″ OF MEL’S MIX Will it actually be better? NO, IF 16″ DEEP SOIL WAS BETTER, MEL WOULD HAVE TOLD EVERYONE TO MAKE THEIR GARDEN 16″ DEEP! Would you fill it with anything else before topping it off with Mel’s mix? NOW YOUR THINKING! READ ON. ! I’m tempted to pull the trigger and do it. YES,ERIC, DO IT- BUT ONLY 6″ IS ALL YOU NEED. READ ON. Is this in fact authentic Mel’s MIx? YES, YES, YES, AND AT A GOOD PRICE. Should I fill the lower part with something cheaper? YES- SAND, DO NOT USE DIRT! SEE NEXT LETTER FOR THE REASONS NOT TO USE DIRT. As to the gentleman and his comment – first we can definitely answer that the garden time bag is indeed an official bag and our official supplier for Lowes. As to the depth of his boxes – since he is a new first time SFGer, encourage him to get sand and place it in the bottom of the box and then lay down a good heavy weed fabric before adding the 6 inches of Mel’s Mix right to the top of the box. Then add the grid(don’t use string) That we then can make use of his current raised boxes and save $ on the Mel’s Mix. As to the exclamation about the investment of purchasing Mel’s Mix or Square Foot Gardening Soil – this is a perfect opportunity to put a positive spin on the longevity you are purchasing – compare the cost to a potting soil you buy year after year – or the quality of ingredients as compared to any other brand of soil on the market – talk about lack of chemicals and how our soil is organic. Find the positive strain in the conversation and build on that. Make a happy newbie who see how wonderful and simple our method is and then do the break down we are so good at – cost per year – for how many years – embrace a new fan and make them smile and feel good! That is what I would answer. Hi Eric, I recommend what they call clean Quarry sand (not beach sand) used in construction and concrete jobs because if you are going to buy something to fill the bottom of a deeper box to be under the 6″ of Mel’s Mix needed for a SFG, this type of sand is the least expensive material for a purchased fill material, it is clean, drains well, has no weed seeds in it, is easy to work with and transport, is readily available,(let your finger do the walking in the phone book) settles down nicely without shifting yet continues to drain well which is very important in a deep box. I do not recommend using your dug up yard soil as it probably does not have very good drainage, is a lot of work digging and transporting, (but it is free if it doesn’t leave a scar or hole somewhere) but is filled with weed seeds and who knows what else, especially if you are in the suburbs or inner city where lead based and contaminated soil may be present from former torn down buildings. If you use dirt, loam, or even most compost bought, it will all contain weed seeds, will settle unevenly or poorly, may decompose further causing a shifting or lowering of your growing soil in your box. Most important, you do not need it for your SFG growing soil unless you want to spend more money to have a deeper than 6″ growing soil. In all cases I would still put down a good sturdy weed fabric over whatever you use for your fill material to make absolutely sure no weeds come up from your existing ground and through or in the fill material from growing up into your Mel’s Mix growing layer. Concerning your parent’s boxes you are going to build, I would suggest you consider staying with the shallow 6″or 8″ box but add a plywood bottom so they could raise it up on any picnic table or church type table if you know what kind I mean. Then they can have sit down/stand up movable boxes. Or set in on concrete blocks at the corners on their patio or deck. Hope all works out for you Eric. Send us photos and consider entering our SFG Photo Contest later this summer. Yes I have and we are finding out that it is fluctuating greatly up and down. We inquired and were able to trace it back to the recent high cost of the ore being shipped in from different parts of the world. Apparently the US vermiculite mines that produce the ore cannot keep up with the demand or some have been restricted from enlarging because of the environmental movement. As you probably know, vermiculite got a black eye 15 years ago when one mine in Montana had asbestos mixed in with the vermiculite ore. That mine shutdown many years ago. Today the inspection by the government is very strict. The good news is that the we at the SFG Foundation are looking into the packaging of the coarse grade in different sized bags that can be shipped right to your front door. Of course the big problem there is the cost of shipping. Sometimes it’s even more than the cost of the product. If we can successfully arrange for all of this, we will have it available on our store front website. So keep watching there as well as an announcement in our newsletter. Are you getting that now? Because of your letter, you have encouraged me to write another blog about vermiculite, it’s safety, it’s availability, and it’s use. I should have that ready for posting by early next week. I think you’ll find it very interesting. I’ll try also to name some sources where the bags are not as expensive. I know Home Depot started to carry it again, but my local store switched to medium grade and put it in 2 cu. ft. bags, but kept the sales price at slightly over $20. Just a few years ago they sold 4 cu. ft. bags of coarse for the same $22. All I can say is keep looking by calling, don’t drive here and there. In my blog next week I’ll suggest other places you can call locally because vermiculite is use extensively in the concrete construction industry as well as the swimming pool installations. Hope that blog will help you find a reasonably priced source, but don’t give up and keep calling around. It’s out there but hard to find. I would not suggest any substitution because I think it’s marvelous, organic, natural material well suited for including in Mel’s Mix. The only substitution that some people resort to is perlite, which is more readily available and cheaper, but if you have read any of my books, you know why I don’t like or use that material. Thanks again for your letter. Here’s a letter that we recently received from Maryjane in FL. She also had trouble with the high cost of shipping from Home Depot. I am so excited to see the Mel’s Mix in bags that can be delivered to my door. I thought the $55 price for shipping was high but was willing to go ahead with it. However, when I went to check out on the Home Depot website, the shipping totaled $400.00 not $55 for 40 bags of the mix. HELP!! What’s going on? I’m sorry to hear about your disappointment. There was a change in Home Depot’s shipping rates a while ago and we are disappointed too. You can take a look at what others have done to reduce the shipping costs in the comments at the following link: http://www.melbartholomew.com/want-to-have-mels-mix/#comments. Some people have had some success in getting a reduced shipping cost when they called Home Depots Customer Service line. I hope the best for you and that you are able to get Mel’s Mix delivered to you at a reasonable cost. Once we found out that Home Depot had not honored the $55 maximum and were charging $10 a bag with no maximum, we posted this the news flash back in July. Mel’s Mix is now available on Amazon.com, in 2 cubic foot bags for $29.97 and if you are a prime member, shipping is free. I just searched “Mel’s Mix”, on Amazon.com, and it came up. Thank you for letting me know about Mel’s Mix on Amazon. What a great deal! Now everyone, anywhere can get Mel’s Mix shipped right to their door and get started on their Square Food Gardens. I’ve put an announcement up on my blog to share the news. Thank you again for bringing this to my attention.